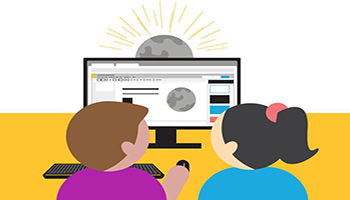 In the 2016 K-12 Horizon Report, the New Media Consortium (NMC) and the Consortium for School Networking (CoSN) explore short- and long-term trends in education, with a focus on how current and emerging technology in education will change learning in years to come. The report reveals that after many years of integrating technology into the classroom, the changes needed to make it effective in improving education are finally being enacted. As pedagogy has shifted so that teachers move throughout the classroom while students work in groups and practice hands-on learning, the design of the traditional classroom is also changing. Citing research by the University of Washington and the University of Melbourne, the Horizon Report reveals that the design of classrooms and school buildings can positively affect student learning, and many of these changes can be easily implemented. Using movable furniture that allows students to group naturally as they work enhances learning, and mobile technologies can travel with students and teachers as they move about. Small changes to lighting, temperature and decoration are also shown to improve learning. As schools plan for facility replacements and upgrades, they can integrate more open learning and gathering spaces, and provide more mobility and internet connectivity, ensuring that future generations will have the flexibility needed to create learning environments that work. The Horizon Report notes that schools in Australia, Denmark and Peru have already created these types of environments and have used them to integrate more student-led, hands-on learning activities. Explore creative ideas on how to integrate technology into your curriculum year-round in this eBook. As schools change their methods of delivering education, they’ll also change their structure. Regimented days with strict bell schedules will be replaced with fluid strategies that more accurately mirror both the working world of the 21st century and the needs of its highly social, interactive and technology-focused students. Many of the redesigns we’ve already seen in classrooms will help foster these types of environments, but the systemic changes to how students collaborate with their teachers and peers will be much more important. We can help this process by leveraging emerging technology in education like collaborative learning tools that allow teachers to work with each other and with outside experts to plan and manage long-term interdisciplinary projects. Mobile devices like tablets will give students access to the subject-matter information they need when they need it, and learning management and assessment tools can help teachers and administrators ensure that students are progressing in each grade level. To help prepare students for future employment in a world where technology literacy is a critical skill, many schools are striving to make computer programming a larger part of their curriculum. One powerful way to do this is to attach programming tasks to non-computer science subjects. For example, students can use Scratch, a programming language designed for adolescents, to create an app that solves a particular math equation or tells an interactive story based on a work of literature they’ve been reading. The Horizon Report includes examples of schools in the United States, Australia and the United Kingdom that are using this type of interdisciplinary approach to teaching programming outside of computer science classes. These long-term trends are exciting, but they will require a lot of planning and collaboration among teachers, administrators, state and federal leaders, parents and community members. We can all follow this research as more school systems try new ways of learning, then work together to implement the best practices in our own school environments. Teachers are increasingly using podcasts as a way to increase student engagement and incorporate more technology in the classroom.